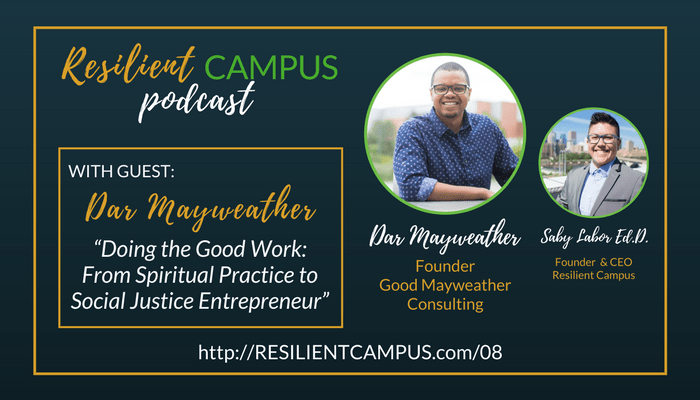 Dar Mayweather shares his journey from childhood spirituality and spiritual community to university employee to social justice entrepreneur. We get a perspective of diversity and inclusion work from both inside and outside the university and campus setting, as Dar explains the principles and tools involved in his practice of deep self work, and how taking risks and staying humble have led to his success as an independent contractor. Dar Mayweather serves as the founder of http://www.doingthegoodwork.com. His pronouns are he, him, and his. A first generation college student, Dar earned a Bachelors in Criminal Justice, a Masters in Education and is currently pursuing a Doctorate in Educational Leadership. His professional leadership journey began in corporate, then mental health, and now higher education. He gets energy from speaking in front of crowds and training people on how to lead across difference. You can follow him @doingthegoodwork on FB & IG and @goodmayweather on Twitter.